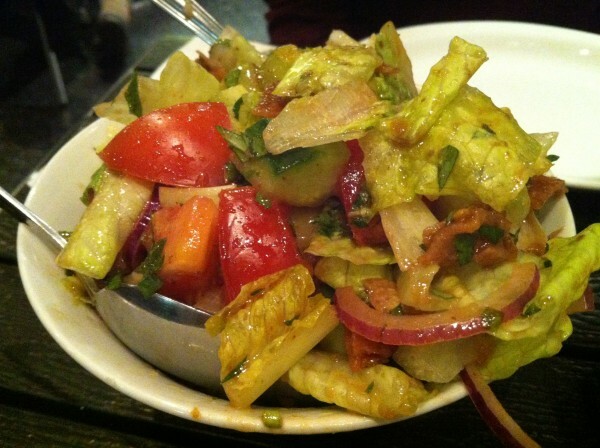 We started out with a fattouch – standard stuff. I enjoyed it but I think the pita chips could have been a little more crispy (or less soggy), and the salad a touch more citrusy/vinegary. The small is more than enough for two people if you’re getting mains as well. I do like the fact that the portion for this order was pretty generous. The pastry plate came with fried cheese rolls and kebbe meatballs as well as lemony spinach and onion pomegranate pastries. These were all pretty delicious – I’m trying to pick a favorite but I”m having trouble! These serve as a nice appetizer to your meal and give you a good sampling of traditional Lebanese dishes which I totally appreciate. The mixed grill came with grilled chicken brochettes and two long pieces of kefta served with a seriously garlicky sauce. 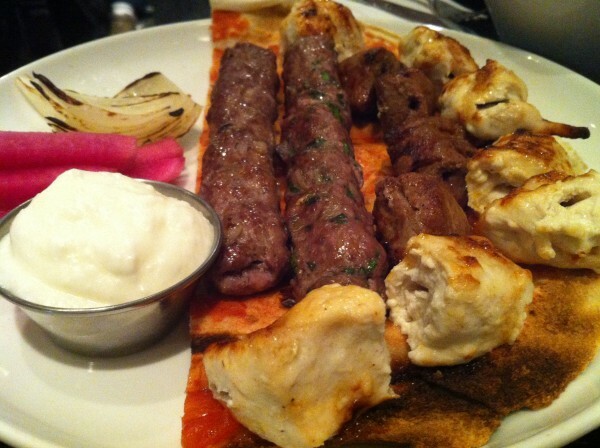 The chicken was tender and the kefta was nice and juicy. Paired with the intense garlic sauce, the meat here just hit the sweet spot. One note – this mixed plate was made for two – I was a little surprised at the quantity of meat on the plate. Is it just me or could there have been a few more pieces? The mouhallabie looked great but could have tasted better. The milk pudding was dry and chalky, bordering on flavorless once the syrupy sauce at the bottom disappeared. The pistachios and orange blossom flavors came through only at the top of the dish where the ingredients were the most obvious. Otherwise, the taste sort of diminished once you got further into the dish. This one I could have done without. 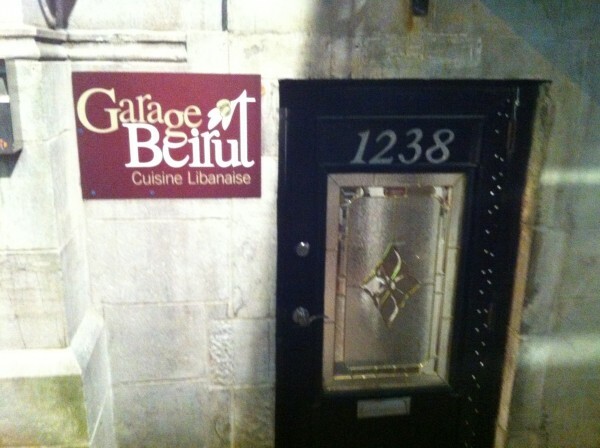 If you’re looking for a sit-down Lebanese restaurant in the downtown area, this is your spot. Prices are reasonable and the atmosphere is warm and inviting. While I’m in no rush to go back, this is still a restaurant that’s on my downtown list. 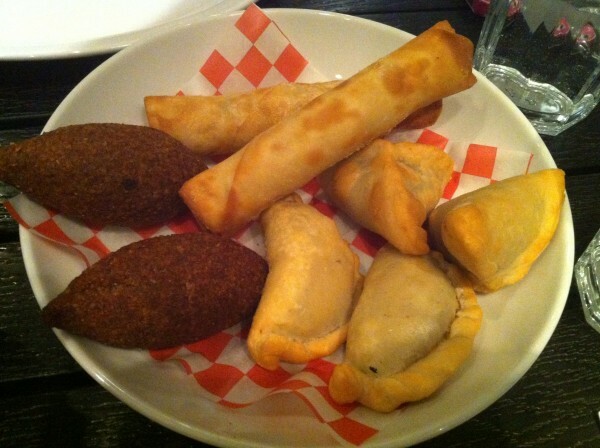 Tags: Dinner, Fattouch, forkandtell, Kefta, Lebanese, Montreal. Very ordinary Lebanese joint. Really nothing special here (we're Arab, we know what we're talking about). At least the place has a certain charm that other Middle Eastern joints in the area lack. Yep, all true! Your take on best Lebanese? Honestly there's nothing that's REALLY great but La Sirene de la Mer is probably at the top. The one on Jean-Talon not Sauvé. 514eats Montreal could definitely use some more competition in the Lebanese department! I've been to La Sirene, liked it but not crazy enough to make the trek. 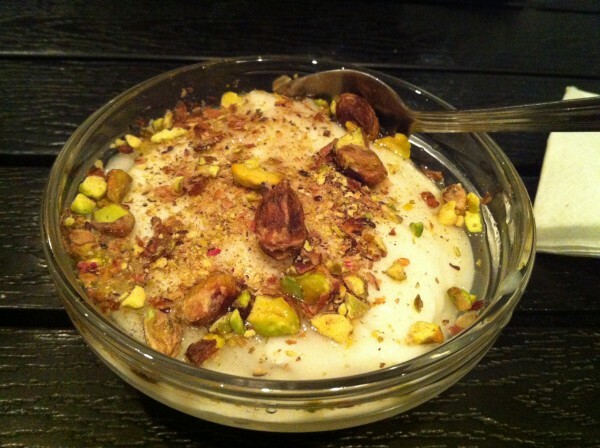 On the Syrian note – I'm obsessed with Kaza Maza… have been for over a year now. Every time is pure gold. If you like Kaza Maza, you will LOVE Damas. I like Damas but Kaza Maza reigns supreme, at least for me. Particularly in terms of pricing, quality and overall experience.